Actualize Wellbeing is a nonprofit organisation set up to provide high quality and affordable counselling. Actualize Wellbeing is a non profit organisation established to provide counselling and emotional well-being for children, young people and families/ carers. We offer Person-Centred Counselling, Clay Therapy and Therapeutic Play for children and young people age 5-21. We also offer relational therapy for families and couples. Sessions are at our consulting room based at the Chess Medical Centre in Chesham. Arrangements can also be made to provide sessions within the school environment. Our Director of Services is Tracy Porter who has in excess of 20 years' counselling experience and over 10 years' experience as a counselling supervisor. She has worked in a variety of settings, including private, public and charitable organisations. She is highly qualified, and maintains professional registration with a number of organisations including BACP (reg 101253). Tracy is also a qualified primary school teacher with a number of years' experience of working in primary schools in Hertfordshire and Buckinghamshire. All our counsellors are appropriately qualified, CRB cleared and supervised by the Director of Services. 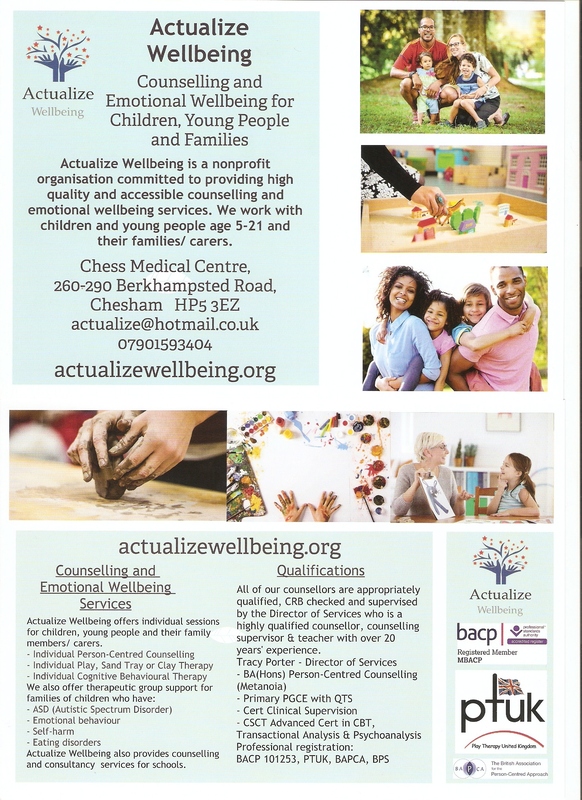 Actualize Wellbeing offers Person Centred Counselling, Therapeutic Play and Clay Therapy from our consulting rooms at the Chess Medical Centre in Chesham, Bucks HP5 3EZ. Our counsellors work with children and young people from the age of 5 - 21. We also offer family mediation and therapeutic support groups for families of children with ASD, eating disorders, self-harm and emotional behaviour. .
We also offer a bespoke school-based counselling provision for Hertfordshire and Buckinghamshire Primary and Secondary Schools. We provide a number of mental health CPD courses developed for schools or counselling organisations. Please see our counselling page for more information on our therapeutic approaches. A session is 50 minutes and you can either attend the consulting room at Chess Medical Centre, or we can make arrangements to work with your child at school. Each session is at the subsidised rate of £35 and we offer a reduced rate for the unwaged. You can telephone or email to arrange an appointment, or use our online booking system. There is a £10 deposit for online bookings. Creative therapy for children from the age of 5. Person-Centred Counselling or CBT for young people up to the age of 21. If you have not visited Actualize Wellbeing before, you will need to have an initial assessment appointment. This is an opportunity to discuss your needs and for us to explain what we can offer. The assessment session is 50 minutes and the fee is £10 with a reduction for the unwaged. Family Therapy sessions are held at our consulting room at Chess Medical Centre. Sessions are 50 minutes and are at a subsidised rate of £35 per session. We also offer a reduced rate for the unwaged. You can arrange an appointment over the telephone, by email or via our online booking system. There is a £10 deposit for online bookings. Therapy for parents/ carers and siblings to attend together. We run a number of therapeutic support groups. This offers the opportunity for you to meet other people with similar experiences and to share and support each other in a safe environment facilitated by an experienced counsellor. We currently offer groups for the parents/ carers of children or young people with; Autistic Spectrum Disorder, emotional behaviour, self harm & eating disorders. Groups are held on Wednesdays and Thursdays. Please contact us via phone or email to join a group. Individual supervision. The first session is £25 for 50 minutes as it is an opportunity for us to discuss our ways of working, therapeutic approaches, your needs, what I can offer and decide whether we have the right 'fit' to work together. f you are interested in group supervision, please contact me to register an interest. Please provide 24 hours notice for cancellations so that we can offer your appointment to another client. The full session fee is payable without 24 hours notice. We are here to help, so feel free to visit within our normal working hours. We are dedicated to improving the lives of those in our community. Your contribution today helps us make a difference. We would like to be able to offer our services free of charge for the unwaged so that high quality mental health services are truly accessible and not dependent on financial ability to pay. Please help us reach our goal! Copyright © 2018 Actualize Wellbeing - All Rights Reserved.